Zapya brings you interesting and viral videos at one place to enjoy and update yourself with latest popular videos. Discover feature of Zapya app includes large number of hot and popular zapya videos to watch. You can follow different channels available on Zapya app and you will see videos according to interest. 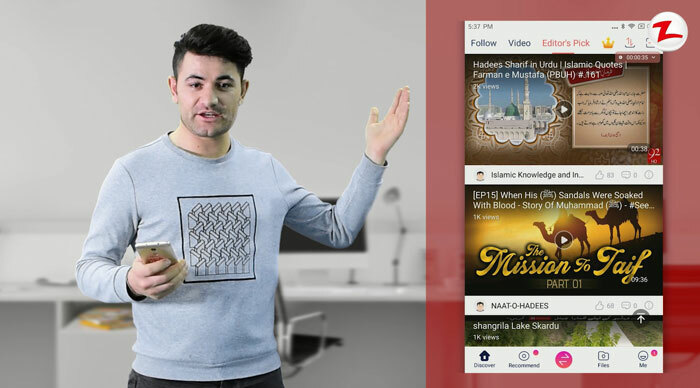 There are videos in different categories including Viral things, Interesting Facts, Food, Naat o Hadees, Islamic videos, Sports, Funny Videos, Cartoons and much more in zapya videos. We bet you will never feel boring and will enjoy videos for long time and come back to enjoy everyday. We also include some popular videos in Editor’s Pick section on the top and these videos are popular and selected by Zapya team. These videos will be popular and viral videos and you will enjoy selected zapya videos. If you have your own interesting videos and you think other users will also enjoy you can upload it to Zapya videos and we will publish it in Zapya videos. These videos uploaded by users can also be viewed by every Zapya user. You can go to profile section of the app and upload your own videos to Zapya discover feature.